Inspired by the prehistoric paintings of the Bushmen & the Sans People of the Kalahari Desert, Obed Muringani artistic style represents a different epoch of Zimbabwe art. Whether painting on skins, metal, canvas, or cow hides, his art is phenomenally unique. 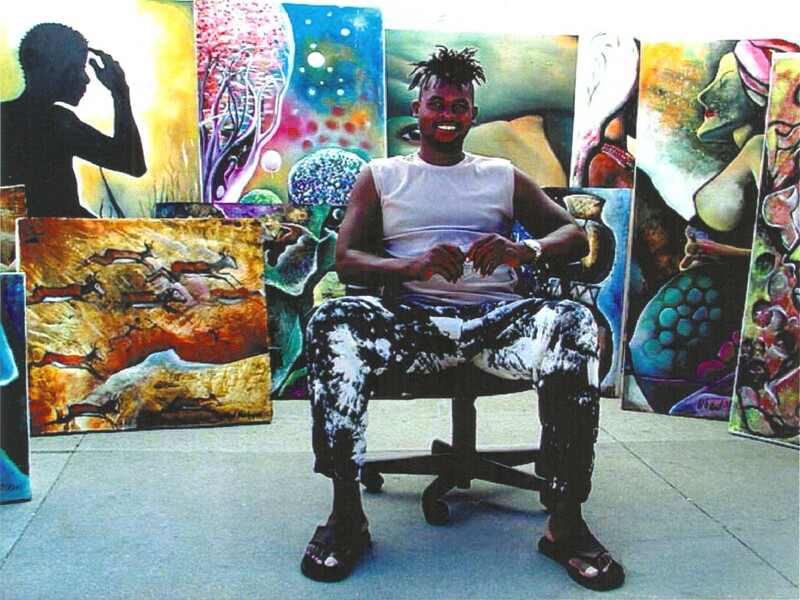 Obed Muringani work expresses freedom, its style is independent, moving against the tides of times and erratic shores. Rich in the provenance of ideas, Muringani calls his work a movement, a movement between times, places, nations and cultures. Obed is maker and breaker of rules, risk in the artistic world, but still an upholder of artist virtues. Muringani's art moves beyond the mere formality which some Zimbabwean painting has become. Through his art, old directions establish new directions, new directions refer to old directions, old beginnings lead to new beginnings and new beginnings lead to other beginnings, thus bridging the gap and linking the old world with the new. His paintings are an expression of the spiritual world; moving between dimensions with such a profound enlightening that only the tip of his paint brush cans truly express the true reality of the inner world.